If asked the favorite food, most of us won't take another moment to think but will promptly say, 'Pizza'. Today pizzas of different shape and taste entertain our taste buds as they are available everywhere around us. Pizza is the name of an oven-baked, flat, usually round bread covered with tomato sauce and often cheese, with other toppings. 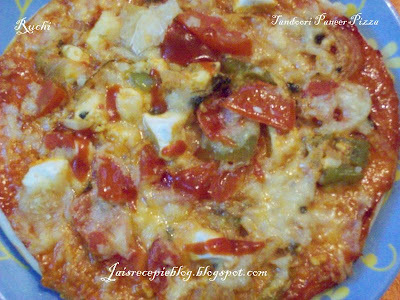 It can be said that it is the pizza toppings which gives each every pizza its distinct taste and flavor.Tandoori Paneer Pizza is a Truly Indian an existing fusion of Italian and Indian tastes. This pizza is a sure tasty treat. Tandoori Paneer Pizza is mouth-watering combination of rich paneer, crisp capsicum, onions, tomato and cheese is a real Indian treat. The taste buds are tickled in fresh toppings that are sumptuous and tasty giving them the unique taste of this pizza. 1.Combine all ingredients from yogurt onwards and mix well. 2. Then add paneer cubes, and mix well till all the peices are covered with the marination sauce. 3. Leave the marinated Paneer aside for atleast 1-2 hours. 4. Cook over charcoal or in the oven until some brown spot appear. Do not overcook. 1. Marinate the paneer, capsicum and tomato cubes in the prepared marinade for about 30 minutes. 2. Heat the butter in a saucepan, add the onion cubes and saute for sometime. 3. 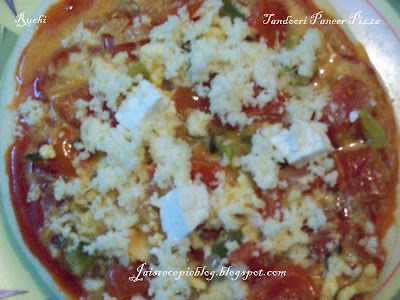 Add the marinated paneer, capsicum and tomatoes and fresh cream and simmer for 3 to 5 minutes. 4. Remove from the fire and transfer to a bowl. Keep aside. 1. Place one pizza base on a greased baking tray. 2. Spread some tomato sauce and tomato chilli sauce on it. 3. Spread half the tandoori paneer filling over the base. 5. Sprinkle half of the cheese on top. 6. Bake in a preheated oven for 10 to 15 minutes or till the base is evenly browned and the chese melts. 8.Repeat with the remaining ingredients to make another pizza. Serve hot..
Homemade ice cream is great for parties, gifts to friends, or just as a tasty desert for yourself. This is because commercial ice cream uses lots of artificial ingredients and preservatives, while homemade ice cream only uses fresh ingredients. Homemade icecream is very easy to make and only requires 5 or 6 ingredients.It might be that much easy to prepare at home. WOwo am just drooling over the pizza n icecream....yummy!!! wow jaishree, nice treats for the week end!!! tandoori panneer pizza looks yummm! 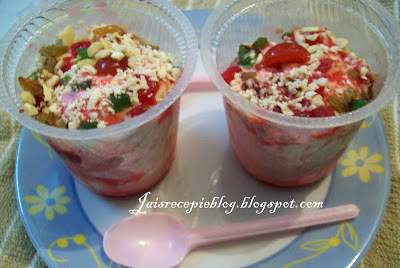 and i love tutti frutti too! Loved the pizza! Tandoori paneer looks so delicious. I couldnt open the post for the parotta and kurma but the parottas look delish! Pizza and ice creams always make me forget myself:) Ur pizza and ice cream looks so colorful and lovely dear. Wow... Thats so lovely! U make me drool here.. Paneer pizza looks fabulous! Its me again... Kept on drooling over ur pizza and completely forgot to comment about your ice-cream. Thats so colourful and wish i could have some with the pizza. hey both icecream and pizza look absolutely mouthwatering.... hmmmmm i am hungry now. past few days i had problem opening ur websites so could not check ur blog..sorry for that...thanks a lot for the awards that u have presented to me....and the unique pizza looks tempting along the ice cream...jsut loved it..
wow both are great dishes...I have never made Icecream at home.Pizza is just awesome! ooh..i'm missing the tutti fruiti icecream. yummy. paneer pizza looks yum too. wow!My first time here...nice collection of recipes some are new to me. Jaishree I was just drooling over the ice-cream :) the pizza would definitely give the pizza hut guys a run for their money :) great! I am simply drooling over the dishes....Ice cream looks rich and pizza with desi paneer tadka wow!!! hayyo.. jaishri love both. my favrt. lovely lovely dear.. i m starting to yr place. 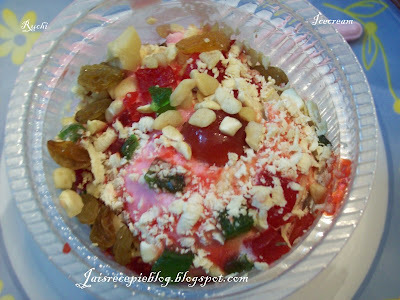 Wow jaishree great recipes i missed few of your recent posts. All are looking good.